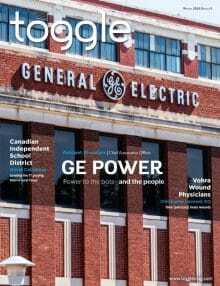 Toggle is a quarterly business-to-business trade journal highlighting the vital role that technology plays in a variety of companies and organizations — making a strong case for the centrality of technology professionals in the day-to-day operations of their institutions. Our journal compiles a collection of stories from the perspectives of technology executives of health care facilities, financial institutions, schools and universities, and other organizations across the country. It also includes features profiling an array of managed service providers to illustrate how some organizations choose to outsource their technology projects to specialists. Whether these operations source technological expertise in-house or from outside their organizations, we explore how institutions tackle the execution of state-of-the-art systems and platforms, the development of cutting-edge hardware and the integration of these technologies into day-to-day operations. Toggle’s mission is to illustrate how technology helps companies to improve workflow, communicate more effectively with clients and operate more efficiently on a general scale. Our journals are much more than a magazine, they tell insightful stories and provide a platform for marketing, sharing information and networking — tying together technology executives from distinct industries. These stories help cultivate stronger business relationships by building brand-specific narratives, allowing top executives to share what sets their companies apart. Our research, production and editorial teams work in conjunction to build high-quality content, culminating a journal our featured companies are proud to share with their partners. With distribution targeting leaders by market, company size and region, we specifically share information where it will be most effective.